Left view is an untreated tumor and right view is a treated tumor. Blue dotted line shows the tumor border. 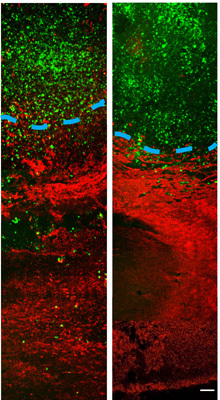 Imipramine blue decreases invasion of tumor cells (green) into healthy tissue (red). Researchers from Emory and the Georgia Institute of Technology have designed a new treatment approach that appears to halt the spread of cancer cells into normal brain tissue in animal models. Treating invasive brain tumors with a combination of chemotherapy and radiation has improved clinical outcomes, but few patients survive longer than two years after diagnosis. The effectiveness of treatment is limited by the tumor's aggressive invasion of healthy brain tissue, which restricts chemotherapy access to the cancer cells and complicates surgical removal of the tumor. The researchers treated animals possessing an invasive tumor with a vesicle carrying a molecule called imipramine blue, followed by conventional doxorubicin chemotherapy. The tumors ceased their invasion of healthy tissue and the animals survived longer than animals treated with chemotherapy alone. "Our results show that imipramine blue stops tumor invasion into healthy tissue and enhances the efficacy of chemotherapy, which suggests that chemotherapy may be more effective when the target is stationary," says Ravi Bellamkonda, PhD, a professor in the Wallace H. Coulter Department of Biomedical Engineering at Georgia Tech and Emory University. "These results reveal a new strategy for treating brain cancer that could improve clinical outcomes." The results of this work were published on March 28, 2012 in the journal Science Translational Medicine. The research was supported primarily by the Ian's Friends Foundation and partially by the Georgia Cancer Coalition, the Wallace H. Coulter Foundation and a National Science Foundation graduate research fellowship. In addition to Bellamkonda, collaborators on the project include Jack Arbiser, MD, PhD, professor of dermatology at Emory University School of Medicine and the Winship Cancer Institute; Daniel Brat, MD, PhD, Emory professor of Pathology and Laboratory Medicine and the Winship Cancer Institute; and the paper's lead author, Jennifer Munson, a former Fulbright Scholar who was a bioengineering graduate student in the Georgia Tech School of Chemical & Biomolecular Engineering when the research was conducted. Arbiser designed the novel imipramine blue compound, which is an organic triphenylmethane dye. After in vitro experiments showed that imipramine blue effectively inhibited movement of several cancer cell lines, the researchers tested the compound in an animal model of aggressive cancer that exhibited attributes similar to a human brain tumor called glioblastoma. "There were many reasons why we chose to use the RT2 astrocytoma rat model for these experiments," says Brat. "The tumor exhibited properties of aggressive growth, invasiveness, angiogenesis and necrosis that are similar to human glioblastoma; the model utilized an intact immune system, which is seen in the human disease; and the model enabled increased visualization by MRI because it was a rat model, rather than a mouse." Because imipramine blue is hydrophobic and doxorubicin is cytotoxic, the researchers encapsulated each compound in an artificially prepared vesicle called a liposome so that the drugs would reach the brain. The liposomal drug delivery vehicle also ensured that the drugs would not be released into tissue until they passed through leaky blood vessel walls, which are only present where a tumor is growing. Animals received one of the following four treatments: liposomes filled with saline, liposomes filled with imipramine blue, liposomes filled with doxorubicin chemotherapy, or liposomes filled with imipramine blue followed by liposomes filled with doxorubicin chemotherapy. All of the animals that received the sequential treatment of imipramine blue followed by doxorubicin chemotherapy survived for 200 days -- more than six months -- with no observable tumor mass. Of the animals treated with doxorubicin chemotherapy alone, 33 percent were alive after 200 days with a median survival time of 44 days. Animals that received capsules filled with saline or imipramine blue, but no chemotherapy, did not survive more than 19 days. "Our results show that the increased effectiveness of the chemotherapy treatment is not because of a synergistic toxicity between imipramine blue and doxorubicin. Imipramine blue is not making the doxorubicin more toxic, it's simply stopping the movement of the cancer cells and containing the cancer so that the chemotherapy can do a better job," explains Bellamkonda, who is also the Carol Ann and David D. Flanagan Chair in Biomedical Engineering and a Georgia Cancer Coalition Distinguished Cancer Scholar. MRI results showed a reduction and compaction of the tumor in animals treated with imipramine blue followed by doxorubicin chemotherapy, while animals treated with chemotherapy alone presented with abnormal tissue and glioma cells. MRI also indicated that the blood-brain barrier breach often seen during tumor growth was present in the animals treated with chemotherapy alone, but not the group treated with chemotherapy and imipramine blue. According to the researchers, imipramine blue appears to improve the outcome of brain cancer treatment by altering the regulation of actin, a protein found in all eukaryotic cells. Actin mediates a variety of essential biological functions, including the production of reactive oxygen species. Most cancer cells exhibit overproduction of reactive oxygen species, which are thought to stimulate cancer cells to invade healthy tissue. The dye's reorganization of the actin cytoskeleton is thought to inhibit production of enzymes that produce reactive oxygen species. "I formulated the imipramine blue compound as a triphenylmethane dye because I knew that another triphenylmethane dye, gentian violet, exhibited anti-cancer properties. I decided to use imipramine -- a drug used to treat depression -- as the starting material because I knew it could get into the brain," says Arbiser. For future studies, the researchers are planning to test imipramine blue's effect on animal models with invasive brain tumors, metastatic tumors, and other types of cancer such as prostate and breast. "While we need to conduct future studies to determine if the effect of imipramine blue is the same for different types of cancer diagnosed at different stages, this initial study shows the possibility that imipramine blue may be useful as soon as any tumor is diagnosed, before anti-cancer treatment begins, to create a more treatable tumor and enhance clinical outcome," notes Bellamkonda.